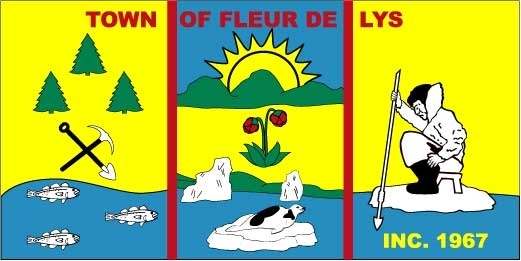 The flag of the Town of Fleur de Lys, Newfoundland and Labrador, has a very complex design. It is vertically divided by two vertical red lines into three fields. The first field contains three trees and symbols of mining and agriculture crossed on a yellow background and three fish on a blue background, the central field contains a yellow sun rising behind green mountains against a blue sky, a pitcher plant (provincial floral emblem) flower on a yellow background two icebergs in the blue water and a seal on an iceberg, and the third field contains an Inuit sitting and waiting to catch (a fish) on a yellow and blue background. Across the upper edge "TOWN / OF FLEUR DE / LYS" in red letters in one line, and "INC. 1967" in yellow down in the third field. Image of the flag from the Town Administration.